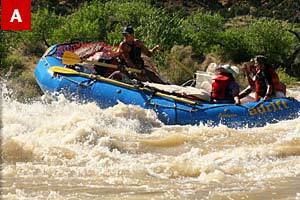 Green River Utah River Rafting | Adrift Adventures Moab Utah! Desolation Canyon is perhaps our most popular family river vacation. A less-known national treasure, Desolation is one of the most scenic, historic and colorful waterway areas on the western rivers. Its brightly colored formations are monuments to the force of Mother Nature. Wildlife thrives: you may see mule deer, desert bighorn sheep, prairie dogs, or waterfowl and desert birds, along with yucca, sage, numerous cacti and wildflowers. Huge cottonwood trees over untouched beaches offer exquisite campsites. 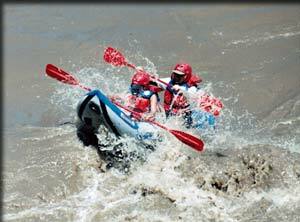 Feel the power of the river pull as your oar or paddle raft drifts along the calmer sections of the Green. 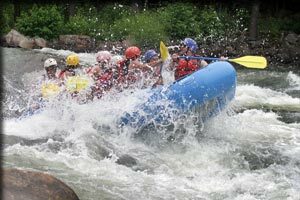 Desolation Canyon has an abundant supply of rapids; over 60 overall on this 84-mile trip. 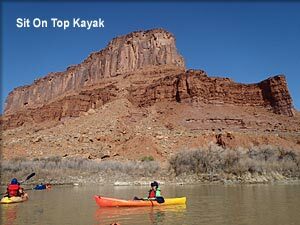 The trip includes a scenic charter flight from Moab to the trip's put-in site at Sand Wash.
Colorado and Green River Multi-Day (4 & 5 day trips) Specials Buy 1 get 2nd half off the adult price on selected trips. Limited availability, call for available dates 800-874-4483. All meals starting with lunch day one, and last day lunch. Option-guided rowing trips, inflatable kayaks, and paddle participation trips are available. Please specify with reservation. Groups of 10 or more recieve 10% group discount. Desolation canyon offers an unforgettable journey through geologic time. You're journey will begin with a 45 minute scenic flight, taking you directly to the put-in. 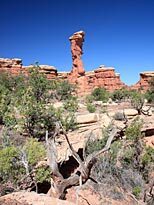 Then during the next 6 days you'll hike to natural bridges, arches, and other prodigious rock formations delicately carved over millions of years. 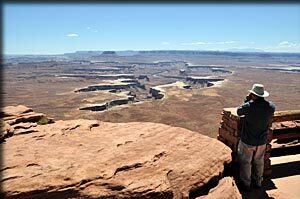 You'll also visit old cowboy hideouts and ancient archeological sites. Crossing blooming meadows you'll catch views of the thriving wildlife and be awed by the colorful scenery Mother Nature has created. As you explore the silent canyons you'll find seldom seen Indian writings. Amid all of the beauty, Desolation Canyon has over 60 rapids. Make sure you bring twice as much film as you think you are going to need! Kayaks are optional, if you would rather be on a raft where the guide rows that is fun too! You also have the option of going back and forth between the two. Trip Price: $1150.00 adult $950.00 youth (5 - 17) Scenic flight, sleeping bag, tent and sleeping bag included. 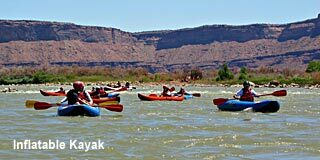 The approximately 60-mile river journey through Labyrinth Canyon on the Green River is a peaceful, remote excursion into Utah's Canyonlands. This seldom traveled waterway offers incredible scenery. 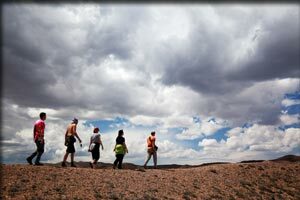 Our Labyrinth Canyon trips offer the perfect solution for those who want the advantages of a wilderness experience in a remote location. 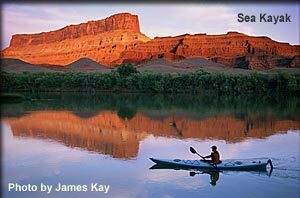 Millions of years of geology and awesome beauty are contained in each river mile. You'll take a journey in time, exploring ancient Indian petroglyphs and soaking in the river's history, geology and archeology. These tangled canyons create a fascinating puzzle you'll enjoy unwinding over your four day trip. Departs every Sunday, Tuesday and Wednesday, April to September. Not included is the $25 departure fee. Includes camping gear.